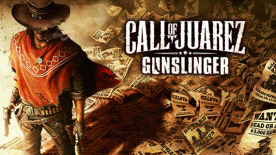 From the dust of a gold mine to the dirt of a saloon, Call of Juarez® Gunslinger is a real homage to the Wild West tales. Live the epic and violent journey of a ruthless bounty hunter onto the trail of the West’s most notorious outlaws. Blurring the lines between man and myth, this adventure made of memorable encounters unveils the untold truth behind some of the greatest legends of the Old West. Dispense your own justice: With a gun holster tied to your leg, become a ruthless bounty hunter on a journey made of all out gun battles. Prevail in deadly gunfights: Master the art of blasting pistols, shooting rifles, dodging bullets and unleash lethal combos to gun down multiple enemies in split seconds. Become the West’s finest: Choose the specific gun fighting skills you want to develop and acquire new shooting abilities to become the West’s finest gunslinger.